Following the trail of the Storm Tyrant's armies, the heroes come to a frost giant village that serves as a training camp, led by a frost giant graveknight who issues orders from within an icy crypt. As the heroes engage in guerrilla tactics to weaken the army of giants and disband the camp, they can ally with a red dragon who seeks to infiltrate the village for her own purposes. Once they've broken the ranks of the giants, the heroes venture into a frozen tomb where they must defeat cultists of the Pallid Princess, morbid tomb giants, and undead war machines before engaging in a climactic battle with the giants' fearsome leader! 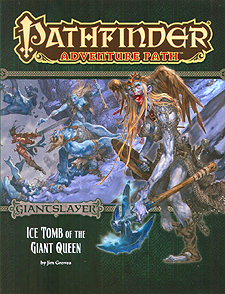 "Ice Tomb of the Giant Queen," a Pathfinder adventure for 10th-level characters, by Jim Groves. A look into some of the most fearsome graveknights in the Inner Sea, by John Compton. Details on some of Golarion's most prominent giant organizations, by Mark Moreland. A tale of shadows and deception in the Pathfinder's Journal, by Clinton J. Boomer. A selection of new monsters in the Giantslayer bestiary, by Benjamin Bruck, Jim Groves, and Thurston Hillman.